Terceira is a human colony planet of the United Earth Government. The planet is notable for its volatile weather and vast oceans. Its wildlife includes giant crocodiles, which roam the planet's swamps. Following the Human-Covenant War, Spartans were deployed to the colony to suppress the local insurrection. A number of MJOLNIR Powered Assault Armor permutations saw use among the Spartan forces present during the operation, including inner-plated forearm guards, and the CIO and Oceanic variants, the latter of which was used in the UEG's mission to reclaim the colony after the United Rebel Front took control of Terceira. The colony is presumably named after an island located in the Atlantic Ocean; it is part of the Azores archipelago, a Portuguese autonomous region on Earth. The War Games map Vertigo in Halo 4 is set on Terceira. 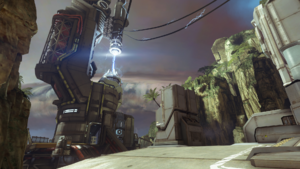 ↑ Youtube Halo 4 Champions Bundle - New Map "Vertigo" Walkthrough!